Landscape grading is one of the most crucial steps to preparing a home’s foundation and property’s landscape against erosion and other damage. Grading is the process of leveling a landscape so the area is even and has a slope downward from the home to the end of the property line. Living on a seaside property is especially dangerous. Rising and ebbing sea levels can pose a risk to your property, causing parts of your landscape to be so moisture-filled that the earth crumbles or the water simply has nowhere to go when it rains, causing your home’s foundation to become damaged. While a seawall does help keep water and soil erosion at bay, having your landscape graded is another great way to protect your home. Here are some signs that your existing seafront property needs to be graded. If water is gathering behind your seawall, your landscape may not have enough slope to successfully filter out water from your property. 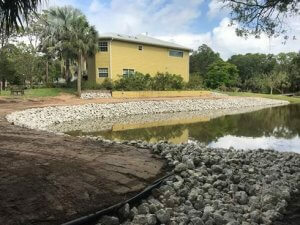 A seawall is designed to keep water away from your property and can only do its job if your landscape has a noticeable slope downward to the seawall from your home. You may also notice water collecting in various areas of your yard. Take these issues seriously as the water will eventually seep into your home’s foundation. Your landscape’s slope may have changed over the years due to tilling your yard for new grass or other landscape upgrades. Consult with a home contractor to see if you need to address grading issues to protect your property. You may notice high spots or deep rivets in your yard, giving your landscape a disheveled appearance. Seaside homes are also built on sandy foundations and the loose-packed soil shifts with time and changes in the ocean’s movements. Salt corrosion from the ocean can also cause damage to a landscape or the home itself. Your landscape should be graded for a few reasons: to re-establish healthy soil and landscape conditions and make your yard more attractive and enjoyable. Remember that if your landscape is higher at the seafront than by your home’s foundation, water will slope toward your home rather than away from it, so you need to have your seaside property graded periodically. Seaside homes built on sand are often designed on flat areas of land for easy and comfortable habitation. However, a slope that is too flat is just as dangerous as a slope that slants towards your house. You can correct an even, flat slope by having a seaside home construction specialist measure the slope at many destination points of your property, starting with your home’s base and ending at your property line. Based on the health of the soil conditions of your yard, the distance of your home from the sea, and how flat your slope is, your contractor may recommend several inches of slope away from your home to make your landscape safer. If you have recently added to your home or made drastic landscape changes in your yard, you need to have your property’s slope checked. The slope that worked for your home’s previous condition may be too slight for the changes made to your property and you don’t want to risk putting your landscape or home at risk of damage or corruption. Living in a seaside home allows you to have access to beautiful views and a unique property. To maintain your home and keep your landscape healthy, you need to know when your landscape should be graded. Our specialists at Abbotts’ Construction are able to address many of your seaside property’s needs. Call us today to address your landscape’s slope.